Mystery surrounds a man wearing a horse's head who has been captured on Google's Street View in Aberdeen. The man - who has become known as "horse-boy" - can be seen in the Hardgate area of the city. The sighting has become a popular attraction on Google's service, which offers a photographic map of streets. The man is wearing dark trousers, a purple shirt - and a brown and white horse's head. Dozens of BBC news website users have e-mailed from across Europe to say they know who horse boy is. Others have sent in images of the mystery horse-head wearer and some have claimed to be him. Stefan Kleen from Germany said he and a friend met horse-boy at a German festival last weekend. He added: "He only spoke English so we didn't really talk a lot to him." Anders Hauge reckons he has been shopping in Haugesund in Norway; John Hammond was convinced he was playing the fairways and relaxing in the bars of Marbella and Julian Sykes said he had been sighted in Cardiff. John Ainsworth insisted he saw horse-boy in Norwich earlier in the year walking through Wensum Park. He said: "I thought I was hallucinating at first but then realised it was real." Other readers have not been impressed with the story and some have told the website that it is not newsworthy and is a prank to generate further publicity. 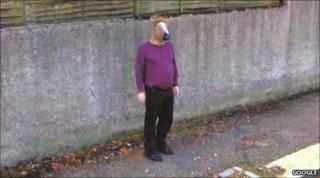 A number of contributors have said that horse-boy features in other parts of Google's street view service. Mark Coates said: "If you go down the road and turn back you can see him putting on the horse head and on the shot back up the road again he has white hair." The BBC news website story had more than 874,000 hits on Thursday, and more on Friday took the total through the one million barrier.